Skin and nail treatments are part of the range of podiatry services we offer at The Foot Clinic. If you have hard, painful layers of skin (corns and calluses), or a hard lump on your foot (bunions), fragile nails or infected toenails, your podiatrist can help you reduce the discomfort and any inflammation that you may have. Sometimes treating these symptoms requires specialised equipment, and self-treatment is not always possible. At The Foot Clinic we will look at your overall health: often a skin or nail condition is linked to other podiatry related problems. If your posture, footwear or lifestyle needs adjustment, your podiatrist will help you with recommendations based on our large experience in all areas of podiatry. Skin and nail treatments focusing on warts will focus on removing the infected skin. Your podiatrist might use liquid nitrogen to freeze the infected area, or might use a burning technique to remove the unwanted skin. Minor surgery is also used, to cut out the wart. For large or deep warts, your treatment may need to be repeated after a few weeks. We see patients experiencing many types of skin and nail problems; ingrown toenails, fungal nail infections, corns and calluses are some of the common conditions we treat. Diabetic Foot Care is crucial for patients who have been diagnosed with Diabetes. Often skin and nail problems are associated with diabetic patients. Fungal infections and fungal toenails can be treated using the latest laser technology. We use the laser light to beam through your nail bed, into the skin under the nail, and this kills the fungus. Alternatively, and depending on your diagnosis, your podiatrist at The Foot Clinic can use a topical treatment. In this case, antifungal substances are applied on the infected toenails on a regular basis. Our skin and nail treatments also include treatment of ingrown toenails. The ingrown part of a nail can cause painful inflammation, and your podiatrist will first focus on removing the ingrown part, to then treat the damaged skin. Next, we will dress the damaged skin to prevent infection. This type of treatment is all about removing excessive dead skin. Because these skin problems are often caused by inappropriate shoes, your podiatrist will make recommendations so you can adjust your footwear. If the uneven pressure causes calluses and corns, then our team may prescribe orthotics, to rebalance the pressure. In addition, we may give you a topical cream, to keep your skin soft and flexible in that area. Some of our skin and nail treatments are designed to help you with wounds and ulcers. The podiatrist will remove any dead or damaged tissue from your foot. Then, to promote healthy tissue growth, we may pad certain areas of your foot to protect them from irritation, in combination with topical or oral antibiotics if needed. 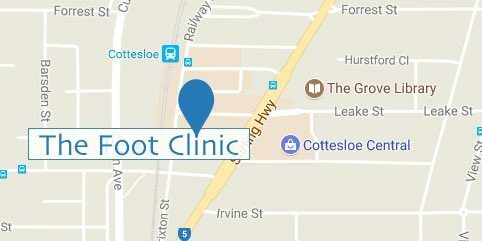 At The Foot Clinic Perth (Cottesloe Central), we always start with a thorough and detailed diagnosis. We look at you as a whole person and check your medical history or any preexisting conditions you may have. We will ask about injuries, lifestyle or allergies, and may use X-Rays or pathology reports to give you the most comprehensive summary of your condition. Then, we will recommend and explain treatment options. At The Foot Clinic, we use the latest technology for our skin and nail treatments, and our team of experienced podiatrists builds on decades of experience in all podiatry areas. At The Foot Clinic we look at your feet, with the intention to “fix them”. But we also look at the bigger picture. We use bio-mechanical assessments to check your walking pattern. This gives us valuable information on pressure and posture problems you may have, which sometimes act as an underlying cause of skin and nail problems. We are very passionate about giving you the best possible care, so you can use your healthy feet and enjoy their optimal function. In other words, it’s our mission to build better bodies, from the feet up, and you can count on us to offer you the highest level of service in our Cottesloe Central clinic.